Buy the necessities before getting your fish. This includes the food, the tank, the filter, substrate, lighting, a heater, and a test kit to measure ammonia, nitrite, nitrate, and pH. You also need water conditioner to remove the chlorine and chloramine in tap water. Spend some time reading the instructions accompanying all of the products you've purchased, as this is a really good way of quickly improving your knowledge and helps you to understand how to set everything up and proper care for that product. 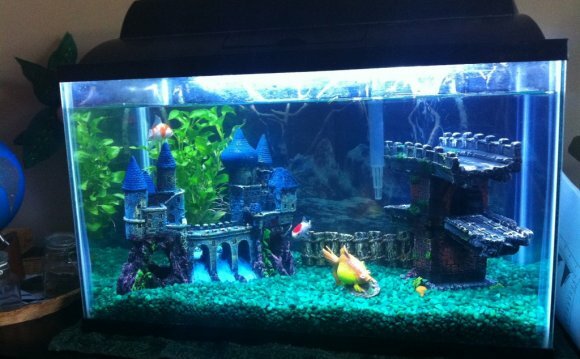 Set up the housing requirements for your fish. Fill up the chosen container with water. Then, turn on all equipment and check that it's all working. It is better to find out the things that don't work and fix them before adding the fish. Consider adding natural water plants. These can have the benefit of offering shelter, filtering the water, and even serving as food. However, be sure to match the types of plants to the fish you're going to keep. Enrich the fish environment. Fish appreciate things to do and places to chill, just like all living beings. Give them things to hide under, rest on, swim through, look at and even be challenged by. This can include beautifully colored gravel, interesting water tank decorations, large pebbles/rocks, and water cascades.